This is one of the most clearly pictured cards in the Minor Arcana. 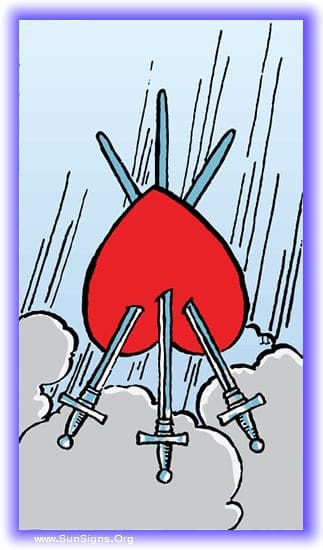 Three of Swords piercing a suspended heart against a stormy sky. The pierced heart is a common symbol, representing every spectrum of emotion from pain to deeply felt love. But the swords represent violence and painful truth, intellect can bring to the hearts realm. The cold rain falling in the background represents sorrow. 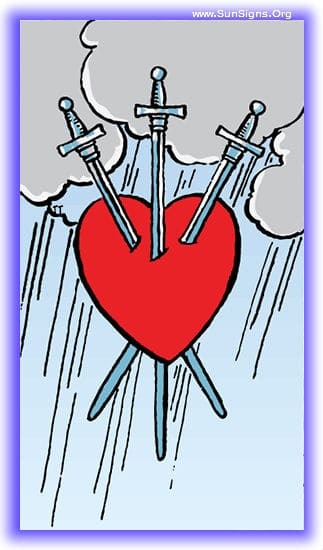 The Three of Swords represents all the negative parts of love. Rejection, sorrow, betrayal, loss, and the utter shattering of our world and its expectations. At its best this tarot card is a warning sign showing us the dangers of our current path, at its worst it is showing us the inevitable events about to unfold. The only positive to be found within this is the hidden meaning of the swords, understanding that sorrow is a necessary part of the path of life will allow us to soothe the pain and move forward, appreciating the lessons learned and the good times had preceding the loss. A painful loss has just occurred in your life, and the ache of it stays with you. The circumstances surrounding the basis of this choice could have been difficult, or it may have been the unavoidable loss of a love one. Either way, with this tarot card in your past it’s time to begin the healing process. You are in a situation that has you in turmoil, but with a simple realignment of view on the situation you can find yourself appreciating the situation for the learning experience it is. It’s time to remove the blindfold and take in the lesson that life is trying to teach you. Down the road you will find a situation arriving that will be difficult. It will be a time that will fill you with disappointment and regret, and may result in someone trying to betray you. At this time the best thing you can do is enjoy the time between now and the event, and then embrace it as part of life’s necessary changes. You have dealt with a loss that cannot be avoided, but with this tarot card in your past you are thankfully on the mend. Their loss will always be with you, but the pain itself will dull, and the emptiness heal. Things are already easier, and they will continue to get easier. The Three of Swords in this positions indicates that you are going through a difficult time, or are about to. The energy of the sorrow of this card surrounds you. It could mean that a relationship is about to separate, or that someone who is sick is coming to the end of their road. The best you can do at this time is prepare yourself to deal with this blow, and appreciate the lessons it brings with it. With the way things are currently going, there is a loss in your future. Pain will be coming, if you have a loved one who is sick, it’s time to start saying your goodbyes, or the relationship you’re currently a part of will not recover on its current path. There may be nothing you can do about this, but for now there may still be time.